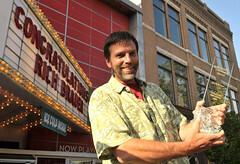 Arriving Tuesday afternoon in downtown Traverse City, the shops and restaurants were already buzzing with business. 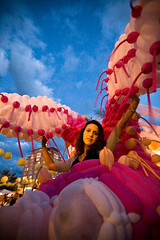 The streets were alive with a playful spirit, filled with children and families enjoying Tuesday night’s festivities, participants of the 5th Annual Traverse City Film Festival. Oscar-winner and Festival creator, Michael Moore, infused the listeners with his passion and commitment for the event and the people who make it happen, year after year. 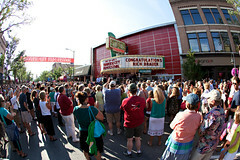 A thick crowd gathered to celebrate the beginning of this year’s festival and to see Traverse City’s own Rich Brauer receive the 2009 Michigan Filmmaker’s Award. The evening evoked an ambiance as potent as votive candles warming a dinner party and transformed a charming little affair – a night at the theater – into a night of magic. Bold red letters hung on the marquee; a stage was set in lights; the streets were busy with shuttering cameras and ticket clad tourists. Separated by only a city block, a stunning foreign film, Troubled Water, explored themes of forgiveness and redemption. The film was screened for two theaters filled perfectly full. Concluding the shows, a question and answer session occurred with the film’s director who had traveled from Norway to present and speak. Shop keepers and locals were embracing the opportunity to participate in Tuesday’s Festival events, which drew attendance from far and wide. The Festival films this season span a wide range of topics, but those passionate about supporting local communities, independent films and the visual arts, were naturally drawn to the scene. Northern Michigan residents hungry for “big city” culture to satiate quaint “little city” life, praised the event. Many young people stationed in the area found an oasis for their creative inclinations. Others simply love film and devour the opportunity to participate in the screenings of documentaries, obscure films, classic, political, and comedic films–just some of the genres represented throughout the week. Along with panel events, lectures, and free family films, the calender of any attendee could be completely filled! Driving home I noticed Will Smith’s head–the size of a truck–looming against the backdrop of night sky, as adventurous viewers reclined at the Open Space to entertain aliens for a night by the Bay. Though I could not see the audience, I imagined children and parents snuggled up beneath the stars, feeling a warm breeze off the lake, their hearts filled with laughter. Who could resist a night so fine? Explore many more photos, videos, blog posts and tweets from the 2009 Traverse City Film Festival.